I remember holding this book in my hands when it first came out years ago. I remember how I thought that it sounded interesting but that it did not catch my interest enough for me to buy it. Now years later, when I saw the audiobook at my local library I had to get it. 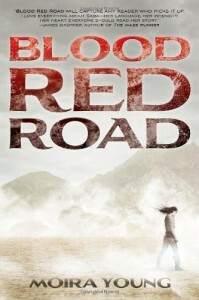 Blood Red Road is about a young woman named Saba living in a very dry, dusty area when her twin brother gets kidnapped. Saba leaves the only place she has known all her life to rescue her brother. What I loved about the book was the fast driven storyline and the strong heroine. Saba is not a weak little damsel in distress. On contrary – she is strong and becomes one of the best fighters in the brutal environment she is forced into. She is headstrong but empathetic. The writing flows easily and the story never gets boring. Until the very end, the story keeps the reader’s attention. This is the first book of a trilogy and I hope to continue with the second audiobook soon.